A desk is much more than a place where you work - these crucial items of office furniture may be the first thing a client sees when they enter your London premises, and may also take prime position in your office during meetings, for example. We’ve had our range of desks made in the UK via our high specifications using top designs and premium materials. As well as featuring attributes that are necessary for your working day - such as a large space for working on - our desks have a fantastic design - fitting well into the modern decor in many of today’s modern offices! This combination of style and functionality makes this a must-have product for offices, and what’s more - we stock them in two different sizes. 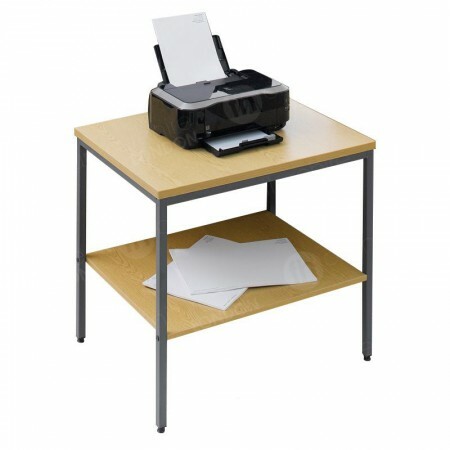 We also have white and light oak finishes available and many other products too that complement office areas, such as printer stands and storage. 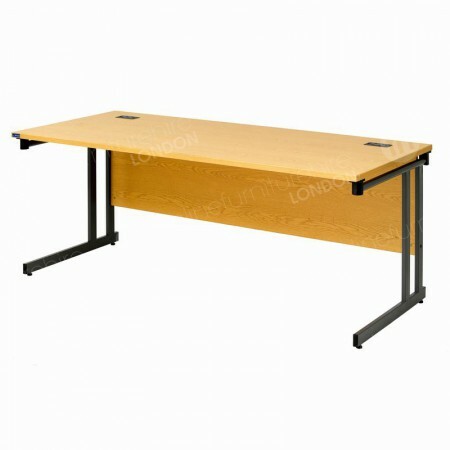 Desks often form the major part of an office set up and once ordered tend to be used for a significant length of time. Whether you’re looking for desking for months/years or for one-off events, such as conferences and exhibitions, we can help you with your desk hire requirements. When you choose our online furniture hire service, you’re free to specify the length of your rental period, this could range from just one morning to weeks and months if you desire. Top locations for short-term desk rental, are conferences, open days and AGMs - even film sets! One reason why this range is so popular for events and for filming locations is because it has a very contemporary and top quality design. A desk you can be proud of when you’re welcoming guests, delegates and potential clients to your event, the light oak finish is very stylish, while the 25mm thick melamine is robust and durable. 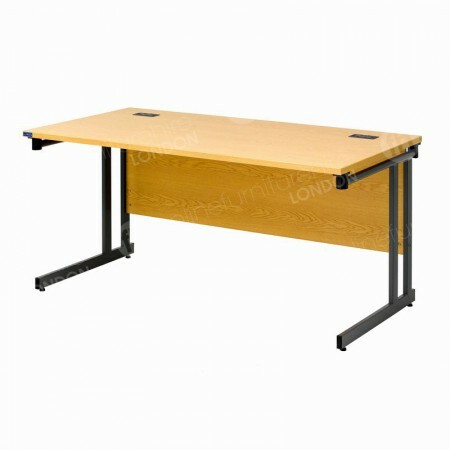 This gives a premium look to both our 1500mm and 1800mm rectangular office desks. The finish is a very innovative material that is manufactured to withstand heat and staining, so they maintain their looks overtime. Another fantastic feature of our desks that makes them particularly useful for events is the fact they take just a few seconds to put up. Simply unfold the legs, set the desks upright and they’re ready for use. In addition to giving your functions a contemporary look, this product line features all the qualities necessary in desks you plan to use in offices and business premises. The surface area for placing PCs, laptops and other equipment is spacious on both models, with more room available on the 1800mm rectangular office desk if you prefer. Cable ports are integrated into all our desking, making it easier to keep the surfaces of desks neat and free from trailing cables. This looks better, but is also safer too, as leads don’t become tripping hazards. As well as selecting items from our desk hire range, you’re also able to choose additional items to create entire functional workspaces, for offices, events, receptions and much more too. Instant offices with our desk hire range! Our wooden mobile pedestals feature a wheeled based so they glide smoothly under our desks, giving you two drawers of storage within arm’s reach. There are several items available from our range that can complete your work station, including office chairs and freestanding screens - the latter being a great product for conferences as they provide a stylish way to create cubicles in which to locate desking.